Ohio played an important role first in the election of Abraham Lincoln, support for Lincoln's war efforts, and finally, after Abraham's Lincoln's Assassination in paying homage to the fallen President. As you tour the Statehouse, you'll notice there are probably more references to Abraham Lincoln than any other person and for good reason. As the Statehouse was nearing completion in 1861, the United States was on the verge of the Civil War. The primary cause of the outbreak of the war was the election of Abraham Lincoln to the presidency and Ohio played a crucial role in his election. Lincoln actually only visited the Ohio Statehouse 3 times. The first visit was in September 1859, this was before he became president. He spoke for more than 2 hours on the issue of slavery to a group of about 50 people standing outside on the east steps of the Statehouse. Today there is a marker next to where Lincoln made his remarks attached to one of the buildings massive columns that is now enclosed in the Atrium. It is not surprising that the great Abraham Lincoln only drew a crowd of about 50 people, because at this time, Lincoln was not well known to anyone outside of Illinois where Lincoln lived. You might say that Lincoln was testing the waters to see if there was any interest in him actually running for office. Also at this time, the governor of Ohio, Salmon P. Chase, was also considering a run for the highest office in the land. In 1859, Abraham Lincoln was still the lanky, clean-shaven man who had not yet adopted his trademark stove pipe hat. When the Republican Convention was held in May of 1860, Lincoln won the nomination of his party. Although there was much animosity in this choice, especially in the South, Lincoln would go on and be elected in November, 1860, even though he wasn't even on the ballot in 9 states. Lincoln didn't receive the most popular votes, he did however, win the most electoral votes in the country to become the 16th President. Lincoln was to be sworn into office in March of 1861. On his way to Washington to take that oath, he stopped in Columbus and spoke to a joint session of the Ohio Legislature in the House Chamber. During this time as he was speaking to then Ohio Governor Dennison in his office (the current office of Governor Strickland), Lincoln received a telegram telling him that the election had been certified and that he was officially the President-elect. The crowd that had gathered at the Statehouse on this visit was considerably larger than his previous visit. After he left Columbus on his way to Washington, there was an attempted assassination in Baltimore and Lincoln had to enter Washington DC in disguise. Lincoln was sworn into office in March, 1861 and in April of that year, the South succeeded from the Union and the Civil War began. This was the last time that Lincoln would visit the Ohio Statehouse. However, 4 years and 2 months later, his body would return for a brief stay after his assassination. In the Rotunda is a monument that was originally placed in its current location in 1871. 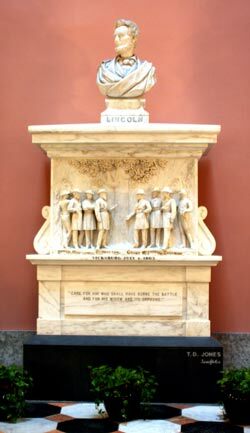 The bust of Abraham Lincoln was carved by Thomas Jones in the basement of the Statehouse, and while he was working on the sculpture, he lived on the 3rd floor of the statehouse in the Relic Room. The base of the sculpture depicts the surrender at Vicksburg which happened at the same time as the battle of Gettysburg which has in subsequent years overshadowed the importance the Vicksburg Surrender played in the outcome of the Civil War. In the early 1900s, the monument was dismantled and removed. Over the years many of the stone pieces that made up the sculpture were lost. Through an extensive conservation effort, the missing pieces have been reproduced and the monument was returned to its original location in 1998 on Lincoln's birthday, Feb 12. Salmon P. Chase served as governor of Ohio from 1855 to 1859 when he ran for president on the same party, but lost to Lincoln. After Lincoln was sworn into office, he appointed Chase as Secretary of the Treasury. Chase's statue is one of the Seven Jewels on the statue at the northwest corner of the Capitol Building.